Shana Tova! I am very excited to celebrate my Bar Mitzvah in Israel over Sukkot. In Israel, my family and I will visit Shalva, an amazing organization that helps people with disabilities. Shalva’s programs offer a variety of therapies, education, sports and wellness, recreational activities and family support. 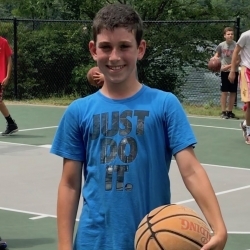 When I visit Shalva, Tamir Goodman (a basketball player once described by Sports Illustrated as the “Jewish Jordan”) and I will enjoy spending time there with the children and teaching them basketball. For me, I can’t think of a better way to help children with many different challenges then through the fun of basketball. I am aiming to raise $3,600 for this very worthy cause. Please consider making a donation to help me reach my goal. Wendy Sassower 180 USD Great work Philip! erica Schwartz 180 USD Mazal tov philip! Leslie Blauner 180 USD Mazel Tov Philip!!!! Kim Heyman 180 USD Mazel tov on becoming a bar mitzvah. Anonymous 300 USD Mazal Tov, Philip! Gerry Mittler 180 USD Dear Philip, We love you are so proud of you. Mazel Tov! Anonymous 180 USD Congrats. So proud of you. Sorry we are missing the BM. Julie and Reuben Kopel 500 USD Mazel Tov Philip! We are so proud of you! The Katz Family 250 USD Malek Tov Philip. We are so proud of you. Larry Heyman 360 USD It's so nice to see you marking this milestone in such a meaningful way! Much Mazel! Anonymous 180 USD What a great idea...combining basketball with helping others. You're the best, Philip! JImmy Haber 180 USD Mazal Tov Phillip! What a great mitzvah project.